People need relief when the dog days of summer are upon us. I just spent some time on the balcony overlooking Clear Lake -- watching the flag snapping in a stiff breeze. One of the great things about the coast is that you get a cooling breeze off the water. Further inland about all that is available is a hot breeze -- if you get any breeze at all. Parts of Texas are in a two-year drought. The weather is producing some strange twists like yesterday’s 106 degrees in Portland, Oregon! The entire Northwest is in triple digit heat. How weird is that? Places keep getting hotter. Almost every sale we have made this year is of the solar version of security film that cuts solar heat 70%, so they can get heat relief along with the hurricane/explosion protection. We seem to be in the calm before the storm. It’s in the dog days like these that people are lulled into doing nothing. The heat bakes the energy and ambition out of you. We haven’t had a big storm since Hurricane season started so it is easy for everyone to think we’ll not have another one this year. Denial is a human condition. Then a storm will spring up and everyone will panic and realize they aren’t prepared for it. Then they will all want to act at the same time and, like the line at the gas station, that never works well. I went to a USGBC meeting listened to an architect presentation on a new school. It was impressive. They have the first geothermal heating/cooling system ever used for a school in Texas. They even have a special $100,000 elevator that will move an entire class from one floor to another. However, I noticed something was missing. None of the glass so necessary for a proper learning environment has security film on it to protect students and staff from flying glass – and allow them to Shelter in Place should something like yesterday’s chemical plant explosion occur. What if a tornado from a storm hit the school during a session? For less than the cost of that special elevator, they could have had that protection from our Armor Glass film installed on their windows, and save energy too. It would also protect the school from breakins and vandals. This week I have a crew working a project in California while I took a much needed break. I needed some offline time to catch up with accounting, the website, etc. -- and to spend some time on that balcony, catching the sea breezes. We’ve got a NY project coming up (for a bank), and more work pending right here. International inquiries keep coming in every week – many are entrepreneurs wanting to get into the business in their own country. Most want the blast protection. We may be in the dog days of summer now, but you cannot repeal the law of nature. Hurricanes are an annual event. Tornadoes too. Nor can we repeal the law of geography; we are as close to the coast this year as we were last year, if not closer after IKE’s erosion. The dog days won’t last forever. This is the calm before the (next) storm…. Here is the latest article on the expected 2009 Hurricane season. Hurricane Gustav caused $4 billion damage in Louisiana and killed 112 people, including 77 in Haiti. Hurricane Ike was the season's strongest hurricane, and the third-costliest storm (more than $19 billion) to hit the U.S., devastating Galveston, Texas, and causing about 100 deaths in the Caribbean and along the U.S. Gulf Coast. In 2008, four storms were notable -- or deadly -- enough that the names were retired -- Alma, Gustav, Ike and Paloma. Armor Glass® International, Inc., a dealer/installer of a hurricane/blast-rated security window film, has posted sales in the first six months of 2009 that are three times more than its last six months of 2008. “We are a green company with a technology that replaces plywood and shutters and also provides security and solar heat relief at the same time,” says founder Michael Fjetland. The Houston Chronicle has a great article by Eric Berger on late start hurricanes that can form and hit within 48 hours. He talks about Hurricane Alicia in 1983 - it formed in the Gulf and struck us two days later! You going to have a chance to put on plywood or evacuate if that happens again? People have got used to thinking they would have a week's notice to watch it coming across the Atlantic. Now hurricanes are forming offshore in the Gulf of Mexico, giving little or no time to prepare. I recommend you check it out. This is not the time to relax and think we 'got lucky' after last years IKE. We could have another one like it - or worse - before the season ends November 30 of this year. During my week without Internet in my east side Seabrook office, I felt like I was on the moon without a radio. So after finding out the digital TV wasn't receiving signals I went to Radio Shack and bought the antenna pictured here ($59 bucks!). When the TV did a new search, with the antenna plugged in, I finally got a working portable TV. But what if you don't have electricity? When I unplugged the high priced radio shack antenna, the digital portable TV did not get a signal. Maybe that is because places like Seabrook and Kingwood are at least 50 miles from the TV transmitters in Missouri City on SW Houston. If you live there, you might not need the powered antenna to get a signal. A friend suggested that the TV and antenna be part of the system powered by the back up generator (if you have one. I don't). That's a great idea. If you don't have a generator or solar panels then a lot of folks like us will be not watching TV updates when the next storm takes out our power grid. Another thing, without power, the digital portable TV battery doesn't last a long time either. After IKE, I would plug the Cell phone and TV into the car battery so it would charge them while it sat quietly in the garage. When I went out on an errand, the car battery could recharge itself. I don't think that system will work next time for the new digital TV's. The County Judge Ed Emmett says that in the next storm either evacuate or 'hunker down.' Don't hunker down without security window film protecting your glass from breach, a generator and a back up portable radio and digital TV. Sunday, my day “off” started with a wait on the Cable repair guy. Someone cut the Internet box to the building, knocking out everyone’s cable. So for a week, there has been no Internet, TV or phone. It took that long to get an appointment but not because the Comcast folks knew it was a problem. They didn’t have a clue. A neighbor told me that I had to ask for a repair guy. When you do, they say “he’ll be there ten years from now between 8 and 11 am.” Well, it felt like ten years. You know it will be closer to 11 but you get up anyway before 8 to make sure not to greet the guy in your shorts and bad breath. Sure enough at 10:45 a.m. the knock came at the door. While waiting for the Cable Guy I proceeded with a test to see how the “do-it-yourselfers” would manage if they did their own installation of our security window film on their windows (to save $$$, right?). So I went about putting the solar security film on three sliding glass doors in the Seabrook condo, to cut the solar heat by 70% and save on my electric bill. Mothers, don’t let your children, husband or significant other do this! It was pitiful. Despite my years of watching professionals do this day in and day out, my attempt at installing film left much to be desired. Imagine someone doing this that doesn’t have a clue. My edge cuts sometimes went wild, leaving a gap like the one in the photo. And I left more bubbles than on one small window than I’ve seen pros do on entire buildings. I could see how someone would not like the results of doing their own installation on their own house. I’d rather avoid them being mad and just have the pros do it. Despite the mess I made, I was impressed how the solar security really cut the heat in my unit and adds privacy during the day. I found out when left a note for the cable guy on the front door saying “Come in, I’m on the balcony.” I figured I could stand out there and take a break and watch for him through the glass door. Scratch that idea. Too my surprise when I got out on the balcony, after installing the film I could barely see inside. I wasn’t sure I’d see if he did opened the door. I noticed this same effect on a courthouse we did. While inside and looking through a window with film, we could see people approaching the building, but they couldn’t see in. If someone were approaching the courthouse (or any building) carrying a gun this “one way mirror” effect would give the folks inside the building time to react without being seen by the person outside. The solar security film acts like one-way glass. Anyone inside can see out, but those outside can’t see in. But to avoid a disaster, just don’t let your children or husband try it alone. LOL. Now I have Internet again (thank god!) and a cooler, safer condo! Let’s call it an accidental test of our emergency preparedness. Someone must have cut the Comcast cable because our section in Seabrook has been without Internet or TV for two days. What an eye opener. 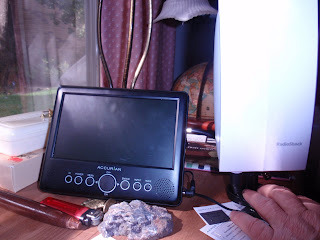 Suddenly, I found that my contact with the outside world was reduced to a Blackberry -- and portable digital TV that couldn’t pick up any of the TV signals emitting from their Missouri City transmitters. The only channel that came in loud and clear was all-Spanish Channel 67. If I don’t know Spanish by the next emergency I will know it a lot better afterwards! It looks like I need to find an antenna that will give the digital portable a signal. This is the time to test our preparedness, not when a hurricane has entered the Gulf of Mexico. It’s too late to go shopping for antennas, or get your hurricane film on your windows, when that happens. I was at Smith Point yesterday, checking a house that sits on Trinity Bay – and took the brunt of IKE last September. As I watched their two lab dogs running and jumping into the water with their toy ball, the couple told me that over 2,000 refrigerators washed up (probably from Bolivar) after IKE – along with two live men. Their houses in Bolivar had fallen into the surge. They clung to debris through the night, including a floating kayak. After the storm one of them was trapped in a fence when Chambers EMS personnel found him after the storm. The couple wanted our Armor Glass window protection. The surge was 8 feet under their house, which survived. Remember, We Cannot Repeal the Law of Geography: We are as Close to the Coast This Year as We Were Last Year, if not closer. And Remember too, that we Cannot Repeal the Law of Nature: Hurricanes are an ANNUAL event. I’ve heard people claim that five near misses by hurricanes in five years doesn’t count as a threat to us. That is like saying that the five bullets that just missed you weren’t really a threat. Some people are already in denial, thinking that it will be years before another one hits. Those who deny and fail to prepare will pay a heavy price when the next one hits. People need to use the brains that God gave them. A little common sense can go a long way. I can see from the accidental test by Comcast that even my system of preparedness needs improvement. If a former TV terrorism analyst still needs to fix his system, imagine how many other people need to do the same…? Now I am wondering if a new digital TV antenna would work if we also lose electricity, such as after a storm. If so, millions of people will not have TV information like we did after IKE because of the digital changeover. Have you got a radio? When I hit Dallas today, my car said it was 107 degrees . Record temperatures even higher than that spread across Texas. It was 108 somewhere. It is triple digit almost everywhere. Crazy weather! It is a Crazy heat that drives people out of their minds if rain doesn't break the spell. But then, being crazy in Texas as as natural as spit anyway. I learned from TV news that a huge hail storm hit Dallas this morning and broke a lot of windows. That nutty weather was no where in sight when I turned up at the peak of the heat. The hotel had skylights that let the sun through like heat lamps. I wished they had our solar security film cutting that blinding light. I'm here because we have a commercial inquiry -- they said they need burglary and break-in protection, which our security film provides. it also cuts the heat - whether it is climate change or not. This morning my Seabrook Rotary club had a spirited debate on global climate change after a young intern from Rep. Pete Olson's office spoke. This will be a good debate for Americans to have. Our future, and the future of our children and grandchildren depend on getting it right...some people were not willing to consider the actual tonnage of emission our global factories produce, which makes no sense. If we are distorting the 'natural cycle' by pumping billions of tons of damaging material into the atmosphere, we better recognize it and do something or our children (and our economy) pay a huge price as a result. If we get it wrong that our future generations are screwed, to put it mildly. Today we have an opportunity to transform our energy sources and develop the technologies of the 21st century. Either we develop them or lose out to other countries who develop them before we do. If China thinks that it wins by polluting more and therefore "paying less", its making a huge mistake - the black air from their factories is killing their own citizens. We treat sewage to avoid the problems like disease that arise when it isn't, right? Why not treat our air emissions for the same reason? We have to constantly innovate our technology or lose in the global technology future. GM lost out to the Japanese who developed hybrid engines when Detroit refused to. GM had zero interest in improving engine efficiencies... so they went bankrupt when no Japanese auto companies did. Only Ford did OK. It is time we got in front of the eight ball instead of behind it. If we mess up we no longer have as habitable of a planet for future generations (of OUR kids, don't forget), so let's take sensible action NOW instead of doing nothing. We have done nothing far too long. We don't get a second chance if we mess up our planet's atmosphere. Check out this article on a new weather phenomenon that means we on the Gulf coast could experience much stronger hurricanes. It's a hybrid El Nino...whether or not it is connected to global warming we don't know. But it is another sign that we need to GET PREPARED. PREPAREDNESS is the word. Too few are prepared to Shelter in Place or weather a hurricane bigger than IKE. So I decided to measure what happens when the sun hits a window. I got out my BTU meter which I use during trade shows and demos (it measures solar heat coming through glass) -- and held it where the sun was hitting the window glass direct. This short video shows how the sun coming out from behind a cloud causes the BTU's to JUMP - from 12 to over 85. And this is with little direct contact from the sun, about 10:30 a.m. facing EAST, with the sun nearly over the roofline. Imagine the BTU's in the afternoon from the WEST! I've decided that I need to upgrade my condo from clear security film to a Solar Security film over it - to get a 70% solar heat reduction. It will cut the power bill for sure. I can't imagine how much higher the electric bills would be from the unfiltered solar heat coming in windows facing the hotter South and West sides! It is HOT out there. I couldn't believe that Texas doesn't air condition its jails (but then I could). That punishes the employees who work at the jails as much (or more) as the inmates! It is so 18th century and can't be justified. We have to act better if we are to claim we are more civilized than the Iranian Ayatollahs, who are now so desperate for an outside villain to blame for the people's anger over an election stolen by religious extremists that they are claiming the British to be the 'bad guys' responsible. Apparently they couldn't make it appear to be American because our leadership wasn't dumb enough to fall into their trap. Their next villains will be the reformers in Iran who are being arrested and tried for merely contesting an unfair, dishonest election. I found an article written by British climate scientists last year that predicted 2009 to be one of the hottest years on record. They are being proved right. For a lot of us that prediction is has been deadly accurate. The grass between Houston and Austin was a dead stiff brown color. I drove past corn fields in the Wharton area that were burned by the sun. Only the fields that were irrigated were green. These increasing temperatures are creating a major water shortage and increasing everyone's energy costs. We put solar security film on a house in Ft. Bend last week. Before adding the film I took a reading of the sun coming through the windows. At 10 a.m. I was getting readings of 165 BTU's! They had walls of glass; all of it was HOT. Our film cut out 70% of that heat coming in that you then have to burn electricity to air condition. So they got hurricane and burglar protection as well as relief from the solar heat. On the way back from a Austin trade show yesterday, I stopped at a place in Wharton where the owner was as worried about UV rays as Hurricanes. He is a cancer survivor. Getting 99% of nasty UV radiation screened out of his house appealed to him. He also wanted burglar protection and solar heat relief. Today I found an article in the Houston Chronicle paper discussing a "hybrid" La Nina/El Nino in the Pacific Ocean that scientists believe will generate even stronger hurricanes in the Atlantic this year. I couldn't find the same article online or I would have provided a link. Our buildings are not ready for ordinary Hurricanes much less "stronger" ones. Our peak month for storms is September. All the big ones seem to show up then. Preparedness is still the word. Are you ready to shelter in place?